Clothes moths don’t kill or bite, and aren’t poisonous, but they are the little jerks of the insect world and have very expensive taste. 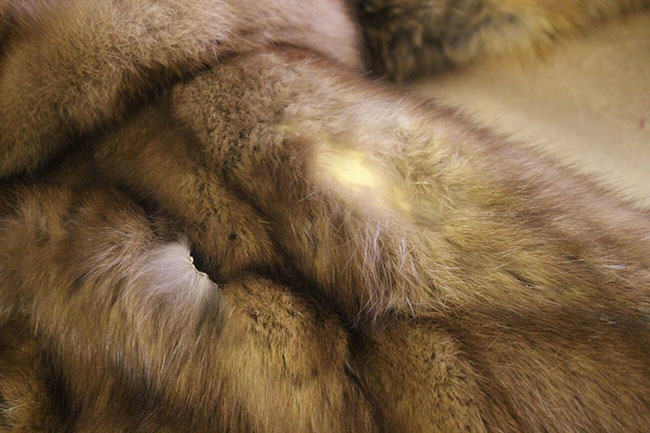 They love furs, cashmere, wool, and any other expensive animal fibers you have in your closet. When it comes to fashion, they are bug enemy number one, but there are ways to keep the little buggers away from your furs, and I’m here to tell you how. 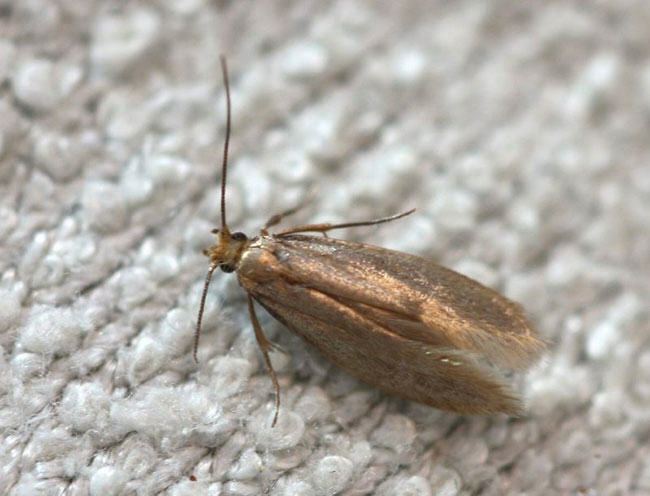 The Tineola bisselliella, or common clothes moth, is enemy number one when it comes to clothing. Photo: Erling Ólafsson. Here are my favourite tricks to turn your closet into a no-go zone for clothes moths. Cedarwood oil: Spray cedarwood oil (diluted with distilled water) around your closet, but away from the clothes, or place cedarwood oil-soaked cotton balls in corners of closets and drawers. Lavender oil: Fresh lavender oil (used in the same way as above) is another nice-smelling clothes moth deterrent. Give them space: Don’t over-stuff your closets and give your coats a good shake every now and then. That makes it difficult for clothes moths to get comfortable in there. Natural repellents: There are quite a few good natural moth repellants on the market, including ones you can hang in between your coats or stuff into the coat pockets. I avoid mothballs, though. They smell bad and are terrible for the environment. Freezing: Note this is of no use on furs as it will destroy the leather, but I will share my trick for keeping wool and cashmere safe from clothes moths: freeze them for 48 hours in September or October. This kills the eggs, and it is actually the larvae that hatch from the eggs that are responsible for the holes in your clothing, not the clothes moths themselves. Professional storage: Your best bet for keeping furs safe out of season or when they aren’t being worn is professional fur storage. If you are looking for storage near you, ask your local furrier. If they don’t offer storage, they will be able to recommend someone who can. A piece of fur that has been damaged by the larvae of clothes moths. Photo: Rebecca Bradley. A sign of clothes moths is if the fur is shedding. The hairs come loose from the leather, and fall out. But don’t confuse shedding with breakage. Delicate furs, like rabbit and chinchilla, are prone to breakage with heavy wear so it is normal that they break and shed a little bit. But if the hair is coming out in clumps, then you probably have moths. Isolate the infested garment. The bad news is, the moths are probably in your other clothes as well so it’s time for a full closet clear out. Fumigation is one solution, but you can also clean and/or kill the moths on your clothes by washing and/or freezing everything, and then cleaning the entire closet like a crazy person followed by an overdose of cedarwood or lavender, to keep them away. Warning, this is not a fun way to spend your weekend. 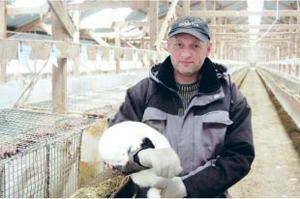 Fur, unlike wool and cashmere, cannot be frozen to kill the eggs as this will ruin the leather. The only way to remove clothes moths is to get a professional fur cleaning. If it is a jacket you bought for $50 from a vintage store, you may want to consider getting rid of it, as it may not be cost-effective to clean, but that is of course your choice. We have a reindeer hide rug that we keep on a bed (removed at night) and a wolf pelt from Canada that’s draped over a chair. The little buggers keep landing on these, even though they’re out in daylight. I shake them very day. Will this keep them free from moths, or more importantly, moth eggs? Yuck.